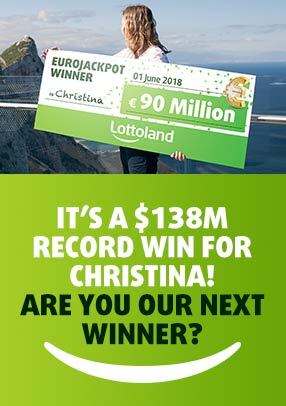 How does EuroMillions at Lottoland work? You can also select the QuickPick option (Quick+1) and this will choose a line for you. Once you have chosen your numbers, select which draw you want to bet on, either Tuesday or Friday, and press Submit. This will take you through to a checkout – at this stage just click Confirm and proceed to place your bet. A single line costs $4.25. A line with the DoubleJackpot feature costs $8.50. For more on DoubleJackpot please see below. The EuroMillions jackpot is capped at €190 million (approx. $265 million). However, you can select our DoubleJackpot feature for the chance to win twice the official EuroMillions jackpot amount. See below for information on how this feature works. The DoubleJackpot feature allows you to go for twice the official lottery jackpot. So, for instance, if the official EuroMillions draw is $80m and you bet on the outcome with us and activate the DoubleJackpot feature, your potential prize will be $160m. The prizes for all other tiers will remain the same. It costs double the price of your normal line to activate the feature. So, if you wish to bet on EuroMillions with the DoubleJackpot feature you’ll pay $8.50, instead of $4.25. The EuroMillions draw takes place every Tuesday and Friday night in Paris at approximately 21:00 CET (16:00 EST). Subscriptions remove the hassle of buying repeat tickets and the fear of missing out on that big jackpot win. Our Subscription feature allows you to set up a running ticket on a given lottery draw. The subscription is open ended and will run for as long as you want it too. You can opt out at any time. Why should I play EuroMillions at Lottoland? The EuroMillions is Europe's most popular draw and you can bet on the outcome and win all the same main game prizes with us. In addition to this, you can take advantage of a range of exclusive features such as DoubleJackpot, LastMinuteTickets, Subscriptions and JackpotHunt that you won't find anywhere else. From a gameplay perspective, EuroMillions and EuroJackpot are similar; both lotteries require you to pick 5 numbers from 50, and 2 supplementary numbers. The supplementary numbers are where the difference becomes clear as you must pick 2 supplementary (Star) numbers from 8 for the EuroJackpot and for the EuroMillions you must pick 2 supplementary numbers from 12. The prices for the two lotteries are also similar. A great tip for EuroMillions fans - whenever there's a Friday draw coming up with a low jackpot check out our EuroJackpot page, as it may well have a bigger jackpot, and at great odds too! Does the EuroMillions have system combinations? Yes, it is possible to select number combinations for the EuroMillions. If you select more than the minimum required numbers (5 main + 2 Stars), then a system selection is made using all the possible combinations possible from your numbers. The more numbers and stars you select, the more EuroMillions number combinations can be made from them.